Saturday August 18th, 11am – 4pm, A.D.O.P.T. 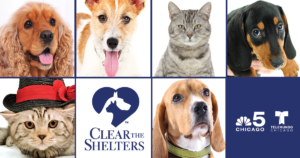 Pet Shelter joins the NBC Clear the Shelter event to help find every pet a forever home! In addition to the mega adoption event, we’ll have lots of fun activities for you to take part in also. Come visit our event day Garage Sale! Pet supplies will be sold to include crates, carriers, collars, leashes, toys, bowls and much more! All proceeds benefit the animals of A.D.O.P.T. Taylor Street Pizza will have pizza and pop/water available for purchase CASH ONLY. ALL applicants will be required to adhere to A.D.O.P.T.’s adoption policies. Check out all the details here. Our 16 year old Westie passed away in April and we have a LOT of stuff we were planning to donate today including several crates, beds, food, ect all clean and ready to go. Will it be convenient today or shpuld we wait until after the event? That is so nice of you. We accept donations daily at the shelter during business hours. Thank you again and we’re sorry for your loss.